Jodi and I wanted to eat Korean food and ended up at Osamil in Koreatown. The name of this modern restaurant comes from their address, 5 west 31st street. 5- Oh, 3- Sam, 1-il. We went on a Friday evening and it was quite busy, its warm dining room being filled with hungry customers. I like the space: it is a mix between a modern and rustic decor, with an open kitchen in the back. I started off with a cocktail rather than a beer or wine that was discounted during a happy hour that ended at 8pm. I chose one of their signature cocktails: The Old World, made with Hennessy, Calamansi Honey, Peychaud’s Bitters, HKB Baiju. I admit that I was a bit surprised when it came as the glass was not filled, giving the impression somebody already drank some. At least they could have put a slice of orange or an ice cube in it to give another dimension to the drink. But still, it was a solid cocktail that I recommend. We started our meal with the roasted mushrooms, a vegetarian dish made of enoki, trumpet, cremini, hon-shimeji and maitake mushrooms, truffle oil and pine nuts coulis. That was a good start, this dish being succulent. 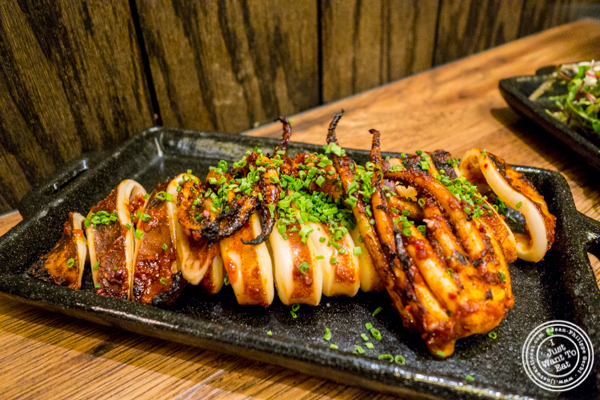 Next was the spicy whole squid that was very spicy! I mean, my mouth was on fire, but it was so good that I kept going at it. It was served with the tentacles and was perfectly cooked, not rubbery at all. It was followed by the chicken wings with their classic sauce that was slightly sweet and not spicy. These twice fried wings were fantastic: delightfully crispy, the chicken was perfectly cooked and moist. Last was the kimchi fried rice with steak. It was composed of caramélisés house made kimchi, bacon for a bit of smokiness, a fried egg and some hanger steak cooked medium for Jodi. I simply loved that dish. The steak was not the best I had and was a bit tough, but the rice was so good! Jodi found it spicy, but I did not taste any spiciness at all, and I was wondering if it was because of the squid. I wish they had desserts as I thought they would make something spectacular. But no, no desserts. In fact, there are not that many Korean restaurants that offer them. Anyway, Osamil is one of the best I had with Hanjan or Danji, serving an unusual menu. I definitely recommend this place.